Avenira’s 80% owned, flagship asset is the Baobab Phosphate Project located in the Republic of Sénégal. The Company is rapidly advancing this project towards production. Avenira has been involved with the Baobab Project since 2014, and acquired 100% of the Project from Agrifos in September 2015. Following acquisition, Avenira secured environmental and community approvals and commenced offtake discussions, leading to a positive Decision to Mine in November 2015. During 2016, Avenira has been focused on mine and processing plant construction and development, and successfully achieved first production in September 2016, just 10 months from the final Decision to Mine. Avenira has been involved with the Baobab Project, in conjunction with Agrifos, since 2014. Agrifos originally launched the project in 2011. A Small Mine Permit (SMP) was granted for the Project in May 2015, and Avenira subsequently acquired 100% of the Project from Agrifos in September 2015. Since then, the Project has achieved a number of key milestones including Environmental Impact Study and Community Support and Relocation Plan approval, leading to a positive Decision to Mine in November 2015. Baobab is one of several phosphate deposits hosted by Eocene rocks of the Senegal Sedimentary Basin. These deposits can be subdivided into two main groups on the basis of age, comprising early Eocene deposits from the Ypresian Epoch (47.8-56.0 Ma) and middle Eocene deposits from the Lutetian Epoch (41.3-47.8 Ma). The phosphate mineralisation developed from deposition of the remains of benthic and planktonic organisms nourished by nutrient rich currents upwelling from the Atlantic Ocean in the shallow seas over continental platforms of the Senegal Sedimentary Basin. Reworking during sedimentation variably concentrated the mineralisation. For most of the Senegal Sedimentary Basin’s area, early Eocene phosphate occurrences are generally low grade, with limited extents. Economically significant early Eocene phosphate deposits are generally located in eastern portions of the Senegal Sedimentary Basin, proximal borders of Mali and Mauritania such as the Matam and Bofal deposits (Figure 1). 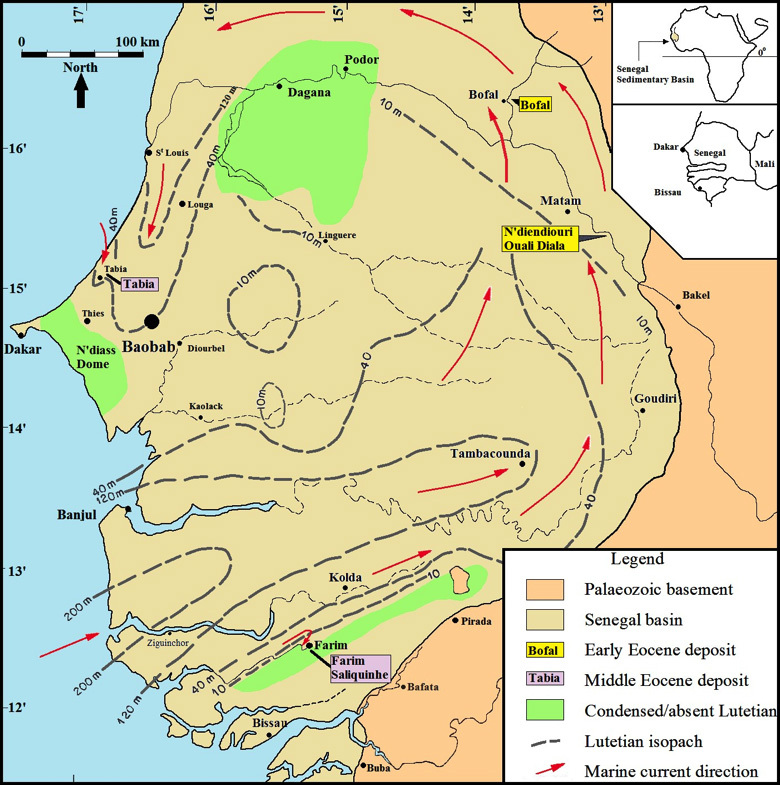 Middle Eocene deposits, such as Taiba and Farim-Saliquinhé, generally occur in western portions of the basin and provide the bulk of Senegalese phosphate production. These deposits were developed around shoals at the entrances to the continental platform. Figure 2 presents an example simplified cross section showing the general Gadde Bissik geological sequence. The geological sequence is flat lying to gently undulating, with mineralisation showing a slight general increase in depth towards the north. In the Gadde Bissik area, basal units of the Senegal Sedimentary Basin comprise a sequence limestone or dolostones which have been rarely intersected by drilling. These units are overlain by marls and marly clays and local zones of nummulitic limestones and underlie the phosphatic sediments. The contact between basement units and phosphatic sediments is commonly marked by a variably developed ferruginous clay layer uncomfortably overlaying the basement. Where present this layer generally ranges from around 0.5 to 3 metres in thickness. The main phosphate mineralisation comprises clayey sandstone generally ranging from around two to twelve metres thick and averaging around three metres thick. Thicker areas are interpreted as lenticular or pod-like bodies. Within this layer phosphate mineralisation is variably developed and occurs as soft to hard pebbles of phosphate of lime, gravels of phosphate of alumina and ferruginous gravels. In higher grade zones the phosphate generally occurs as pebbles varying from brown to beige to white. The main phosphate layer is overlain by a layer of commonly gravelly aluminium phosphates (PHAL) with P2O5 grades of generally less than 5% with higher grades only rarely intersected in drilling. Where present, this layer is generally around one to rarely five metres thick. The aluminium phosphate zone is overlain by clayey sands (SAAR). Phosphatic units do not outcrop in the project area with an average depth to mineralisation of around 29 metres. Figure 2: Representative geological cross section, looking west. Want regular email advice about announcements or media releases made by Avenira?